Most of the time, athletes on the Freeride World Tour look graceful and epic. This video, however, is not that. 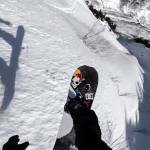 Sit back in awe at these unbelievable crashes over cliffs.